Viva Puerto #11 | Whales And Dolphins, Oh My! Whales And Dolphins, Oh My! << PREVIOUS: Life is a “Beach”, or is it? Whales and dolphins, being sensible mammals, head south in the winter. Thousands from as far away as Alaska pass along our coast from November through April on their yearly migrations You can actually see the whales from our beaches, or you can get closer by going out on a launch. Lorenzo Bini of Deep Blue Dive at the Hotel Ines on Zicatela is a major whale enthusiast. 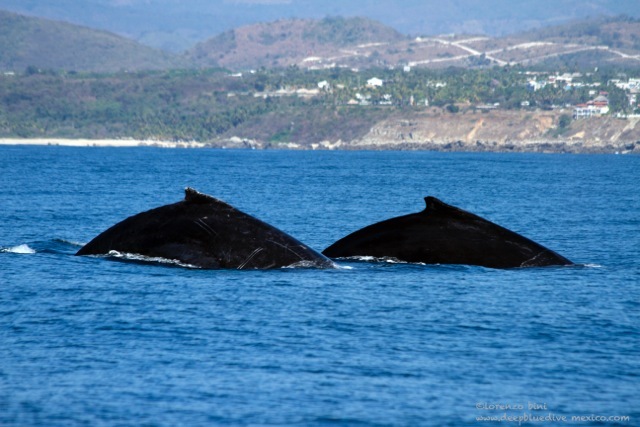 He says that the most common species seen in Puerto is the humpback whale which feeds on krill in the northern pacific in the summer and then heads for warmer waters in the winter to give birth and mate. 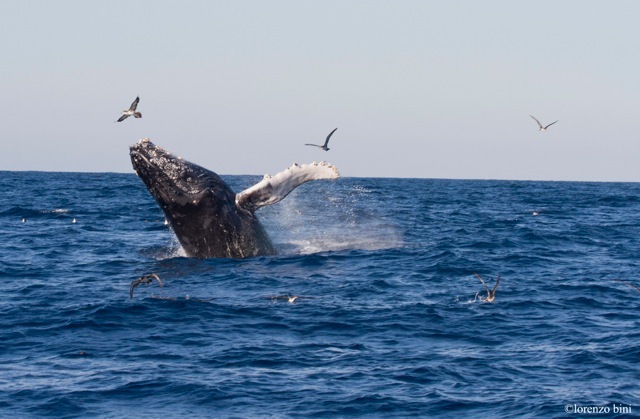 Although the trip usually ends in Central America or Colombia, it is not unheard of for a whale to calve in Puerto Escondido outside of Punta Colorada or La Punta de Zicatela. A few years ago, a whale gave birth just 300 meters from the Hotel Blater on Zicatela. The humpbacks stay close to the shore to protect their offspring from killer whales. They carry their babies on their backs or sides and teach them how to swim. Baby whales gain 90 kilos a day, thanks to the very high fat content of their mothers’ milk. Be very careful if you are diving near whales with babies. A local diver was badly injured by the lash of a fin of a mother whale when he tried to take photos. Whales famously flip onto their backs when they come up for air. This is to protect their lungs, which cannot withstand the weight of their fall. Large blue rorqual whales can be seen off the coast in February. February is the month when the sea is most alive, according to Lorenzo, and the best time for spotting sharks and other marine life. Dolphins are also plentiful in the winter. The largest is the pilot whale, a species known for its social organization. Bini once saw a school of 20 of these large dolphins attack a group of humpbacks trying to get their babies. They are also called false killer whales. 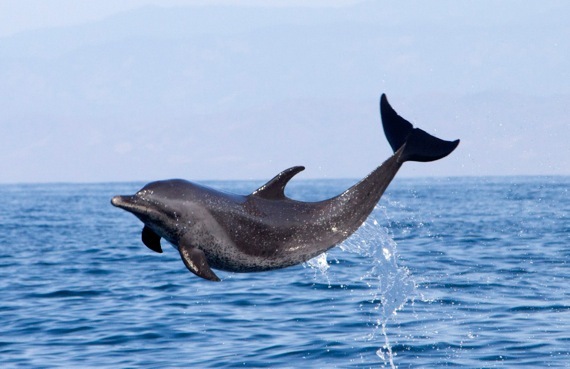 Spotted dolphins, white-sided dolphins, bottle nose and spinner dolphins are also common here. Lorenzo cautions divers not to get too close to the dolphins; he has seen one grab a diver and hold him under water almost to the point of drowning.